The Woodline WD-50 keeps the unusual styling of SOG's other Woodline civilian survival knives but condenses it to a folding build. 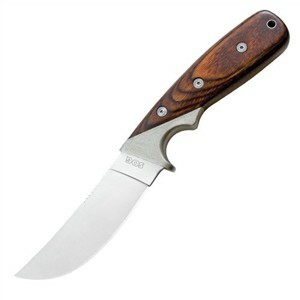 You still get a knife big enough to depend on for chores around camp or for dressing small game and fish. Adding stainless steel handle liners and other hardware raised the weight of this smaller knife to nearly the same as for SOG's small, fixed blade Woodline knife. With a 3.4-inch long blade, there's only just over 1/2-inch less cutting edge in the WD-50. All blades in the Woodline series are made from the same high carbon 8Cr13MoV stainless steel and hardened to a tough 57-58 Rockwell rating. The WD-50's flat ground blade shows the upswept point of a good skinner, built so you can slice with the belly of the blade instead of scoring with the point. Since there's no serrated portion, you can do fine work at camp with full leverage, right up to the bolster. A jimped section of blade spine gives more control of the cut whether you power it with your thumb or guide it with your fingertip. Dual thumb studs allow one-handed opening for either right or left hand. As the blade closes, the thumb studs rotate back into the finger choil and out of the way. In this smaller folder, you'll still get nearly five inches of wide hardwood-slab handle, so even big hands should find it practical. The SOG Woodline series includes two fixed blades in this same style -- start with the Large Fixed Blade SOG Woodline if you're looking for a tougher survival tool.